News and updates for our packaging community. We are pleased to announce the election of three new members to ISTA’s Global Board of Directors. 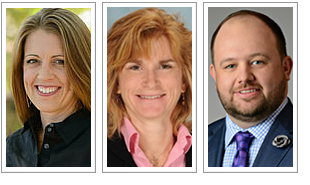 New board members include Nora Crivello, President & CEO with Westpak, Jill Martin, Fellow at Dow Packaging and Specialty Plastics and Jonathan Quinn, Market Development Manager with Nova Chemicals. Each individual has extensive experience in the packaging industry and will provide valuable input and perspective to ISTA. Congratulations and thank you to all ISTA members who participated in this important election process. Learn more. This is your last chance to save! Early-bird pricing ends Friday. Register now and join us at the ISTA Forum, May 13-16 at the Gaylord Rockies Resort & Convention Center in Denver, Colorado. The ISTA Forum brings together the packaging community through two co-located events, TransPack and TempPack. TransPack provides a balance of valuable presentations, case studies, research and solutions from world-leading experts surrounding the optimization of packaging for transport. TempPack focuses on technical topics related to global temperature controlled performance packaging. The TempPack event creates an opportunity for presenters to share their insights, challenges, case studies and research having a direct impact on the industry. Both events are designed to create opportunities for you to network with like-minded professionals who are facing the same challenges in all different sectors and verticals. Speaking at ISTA's Omni-Channel Packaging Strategies Conference provides numerous benefits for you, your projects and your company including exposure and credibility as an industry forerunner! Omni-channel case studies (new design, redesign, root cause analysis). Innovations in retail automation and technology impacting packaging. Packaging innovations for omni-channel retail. Supply chain evolution and innovation. Marketing strategies impacting packaging for omni-channel. If selected to be a program speaker, your attendee registration will be waived. Submit an abstract today for consideration. The ISTA Omni-Channel Packaging Strategies Conference will be held October 2-3, 2019 in Chicago, Illinois at the InterContinental Chicago Magnificent Mile hotel. Through a balance of valuable presentations from leading experts and corporations, the 2019 Conference will offer solution driven discussions around the complexity channel-proliferation introduces for stakeholders across the distribution chain. Last year’s conference in Charlotte, North Carolina was well received by professionals challenged with developing solutions to meet the demands of Omni-Channel distribution. Your feedback matters! As part of ISTA’s annual protocol review, the Testing Council is seeking your feedback, through a brief survey. Congratulations to our most recent CPLP recipients. Well done! ISTA’s Career Center is a great resource to post and find a job within the packaging community. Check out the current postings!